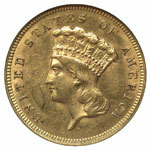 The exact reason for coining a gold piece valued at three dollars beginning in 1854 seems to have been lost to history. One possible explanation, taken from Congressional testimony, is that the lowering of postal rates to three cents at about that time permitted the purchasing of 100-subject sheets for exactly three dollars. Evidently, the demand for this coin was never great, since the highest mintage ever recorded were the 163,738 pieces struck in 1854. After 1857, and though the end of production in 1889, the annual coinage of three-dollar pieces only rarely exceeded 10,000 coins. 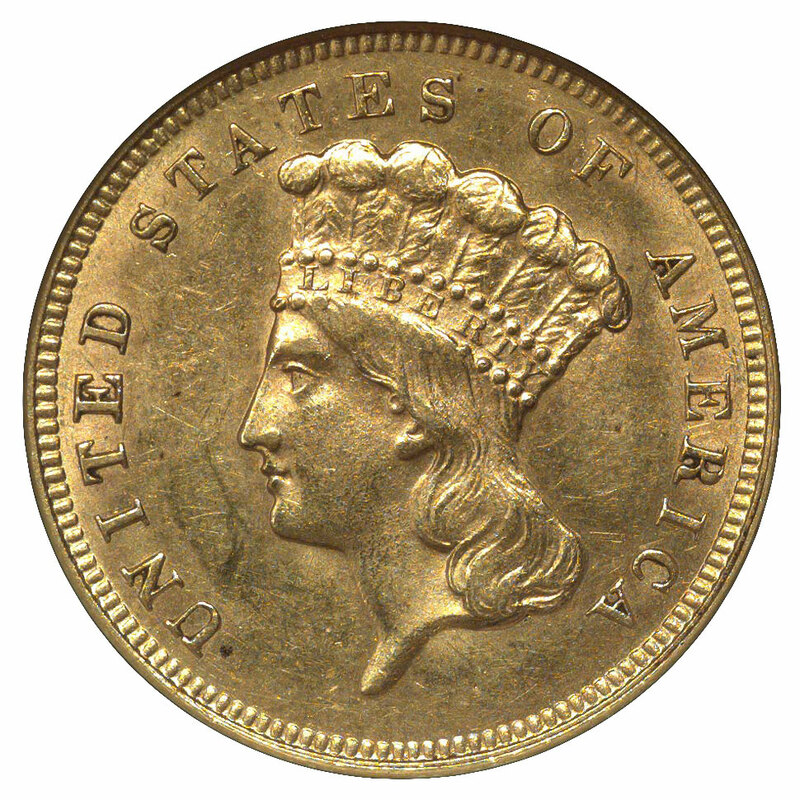 Three-dollar pieces of any date and mint are scarce in all grades, a status enjoyed by very few United States coin types after the initial issues of the 18th Century. Most collectors consider themselves fortunate to own just a single example, since even the most common dates are worth a thousand dollars or so in worn condition. It's rare for any collector to assemble a date and mint set of these coins, and so most hobbyists will content themselves with a nice example for their type collection. With just a few exceptions, all issues in the three-dollar series are typically well struck. Chief Engraver James B. Longacre was careful to not place obverse and reverse relief elements in opposition to one another, which would have resulted in poor metal displacement, the primary cause of incomplete striking. The book The Official American Numismatic Association Grading Standards for United States Coins notes that the 1854-D and 1854-O three-dollar pieces are "usually weakly struck below LIBERTY…" This is reflective of the typically poor quality of the coins from these mints, a situation common to most of their products during the 1850s. In the same book is the notation "Almost all S-mint three-dollar pieces are weakly struck." In my own experience, I've found the degree of weakness on San Francisco Mint three-dollar pieces to be less extreme than on the 'D' and 'O' coins. As a general rule the early dates in the three-dollar series (1854-60) are nearly always found with moderate wear, the middle dates (1861-78) are usually found just lightly worn, while the later dates (1879-89) are typically mint state or extremely close to it. Of course, there are some notable exceptions. The 1854 issue (Philadelphia Mint only) was saved in some numbers as the first emission. 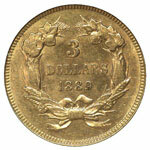 The 1868 three-dollar piece is a bit more common uncirculated than its contemporaries, for reasons unknown. The 1875 and 1876 coins were struck only as proofs. 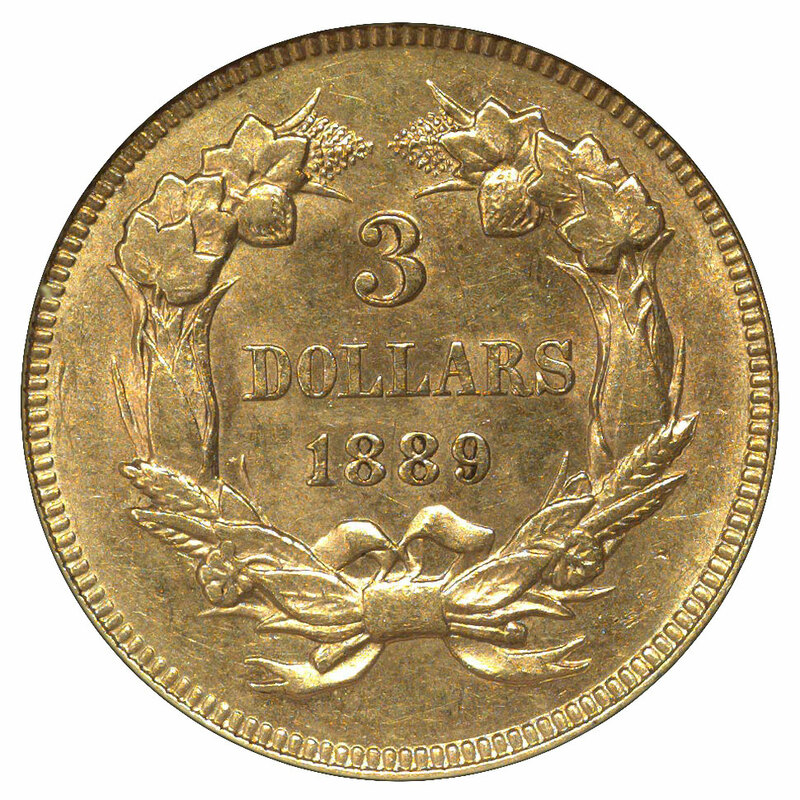 Finally, the 1874 and 1878 three-dollar pieces were minted in greater numbers than surrounding dates and enjoy a relatively greater population of mint state examples. These two dates, along with the 1854 emission, account for the majority of collectors' type coins. While there appear to be enough three-dollar pieces in various grades to meet the demand from advanced type collectors, the number of mint state specimens is limited. Choice and gem examples are highly sought, but the population of certified pieces drops off dramatically with each incremental grade above MS-64. As with all alloyed gold coins (United States issues are .900 gold and .100 copper), the base metal component will sometimes manifest itself. This usually takes the form of faint, peach-colored toning and can be quite pleasing. Less attractive are spots of concentrated copper which are typically a deep reddish-orange. These have only a minimal impact on a coin's grade, though they may affect its aesthetic appeal as viewed by the individual collector. More serious are what have traditionally been called "carbon spots," though it's doubtful that the exact nature of the contaminant is really known in most cases. These black spots are etched into the coin's surface and cannot easily be removed. Such spots may result in downgrading an otherwise attractive coin and should be avoided.